Are you overwhelmed and things are getting out of control? 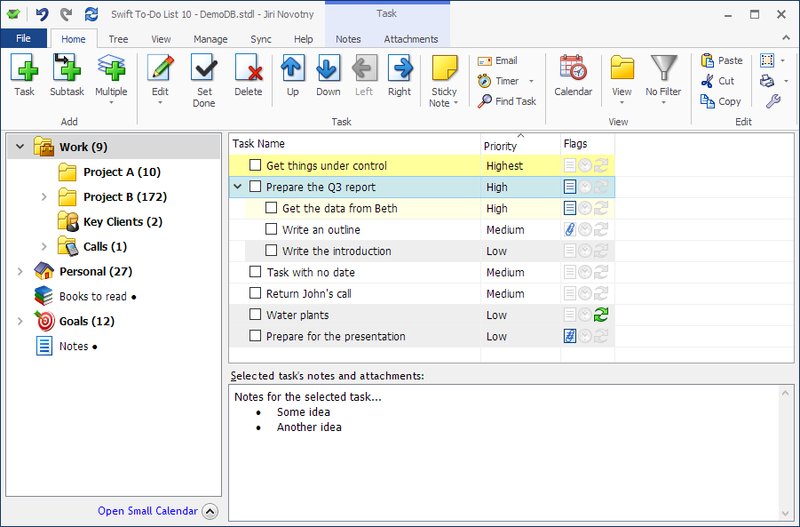 The best task management software for Windows can help you. Free your mind from constant worrying and mental lists. Become more efficient, reliable, productive - and happy! Finish your projects. Get that promotion or grow your business. Download Swift To-Do List and get organized in 5 minutes! Desktop app for Windows 10, 8, 7, Vista, XP. Mobile app for iOS, Android. Web app for Chrome, Firefox, Safari, IE. (...) so many people have noticed a change in me - I am more productive, happier - and I tell all of them its because of this miracle program. I now have a secure place to put all the "stuff" that was whirling around in my head or the scattered papers. Swift To-Do List is the best ever organizer in the world!! It became the most necessary tool for my job and I can't forget anything at all now.. So happy about it! Thanks! This is the best program I have ever used. It's amazing how getting organized can give you a sense of relief from your daily stresses. Great job. I will recommend this product to everyone.